(CNN) -- Alberto Contador destroyed his rivals in the first Alpine stage of the Tour de France, taking over the yellow jersey with an impressive victory in the 207.5km 15th stage from Pontarlier to Verbier. Alberto Contador celebrates after his superb stage 15 victory saw him take the Tour de France yellow jersey. The 2007 Tour de France winner launched a devastating attack on the slopes of the final ascent of the day, leaving his rivals standing to finally cross the line 43 seconds ahead of Luxembourg's Andy Schleck, with Italian Vincenzo Nibali third another 20 seconds behind. 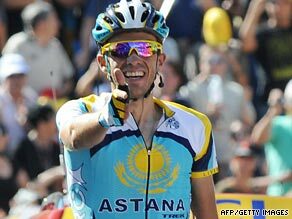 The Spaniard's success moves him one minute 37 seconds ahead of Astana teammate Lance Armstrong, after the American seven-time champion was left behind by Contador's attack - eventually finishing down in ninth position. Briton Bradley Wiggins, who has re-invented himself as a genuine overall contender after being known primarily as a time-trial specialist, finished fifth on the stage and now lies third overall - another nine seconds behind Armstrong. Another Astana rider, Andreas Kloden, is up to fourth place in the overall standings while Schleck - who was the only rider to attempt to follow Contador on Sunday - is now fifth in general classification. Italian Rinaldo Nocentini, who had held the yellow jersey since the seventh stage of the race in the Pyrenees, came home in 19th position - 2:36 behind Contador - and drops down to sixth place overall, two-and-a-half minutes off the pace. "I'm very happy with this result," Contador, who since the start of the race has had to endure the extra pressure of Armstrong's presence in the team, told reporters. "It wasn't a long climb, but we started it really fast and in the end I managed to do what I wanted to make the difference. If I wanted to leave my rivals behind me in the standings, that was the only way I could do it." Armstrong admitted he was "on the limit" as early as the bottom of the climb and from then on had little else to give. "I suffered. It was very hard. I was a little bit on the limit at the bottom, I think everybody was a bit on the limit," said Armstrong. "But Alberto showed he is the best rider in the race." Meanwhile, Briton Mark Cavendish has given up hope of claiming the sprinter's green points jersey, after he was docked points for dangerous sprinting on Saturday. The 24-year-old was incensed by a decision to wipe off all the points he earned on the 14th stage after Tour organisers judged he had driven Thor Hushovd, his rival for the sprinter's crown, too close to the barriers. Hushovd had himself lodged the appeal to race organizers, which also aggrieved Cavendish, who now finds him a near-unassailable 18 points behind the Norwegian. Cavendish told Eurosport TV: "Obviously it is over for me. That is how it is now. I hope Thor can sleep at night. But what can you do about it? If it means that much to him, then so be it."